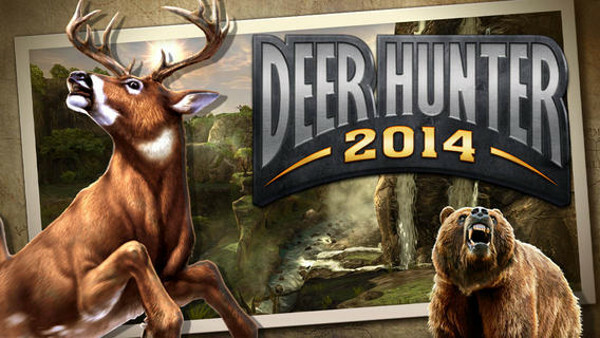 In the realm of mobile games you don't see many straight-up hunting titles, and even when you do find one, they are rarely as complicated or as challenging as Deer Hunter 2014. That said, the first thing we need to point out is that this is NOT a game for young kids. The point to this game is to take adult weapons, and go do an adult activity - hunt animals. And it is not just deer that you are hunting (despite the name) as the game includes a variety of long-arm weapons as well as shotguns, and features a range of animals from the deer to ducks and everything in between. Speaking of blood - the shots you take in the game are very much similar to that found in hunting - so you will see during specific challenges requirements for specific shots - such as heart, lung, or head shots. Practically speaking the worse shot you can take is a body shot, since odds are the animal will not instantly go down and die from it, which means you know, you failed to kill it and left an injured animal to die a slow painful death in video game land. While the game is free to download and play, it has a pretty hefty in-game purchase system as well as supports direct advertising. The in-game purchase system is divided into what you might call optional and nearly-forced segments. On the optional front we have limited time and special offers for better weapons that will pop-up that require you to use in-game gold (a Premium Currency), as well as deals that require you to spend real-world money. 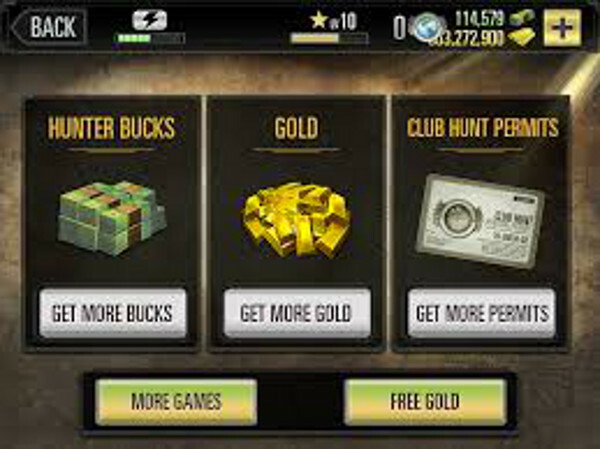 Examples of these include the Starter Pack (this costs $4.99 and includes a Vorovskey KA-48 that is similar to the AR-15 from Colt, 30 Gold Bars - the Premium Currency of the game - and $1,500 Hunter Bucks - the Non-Premium Currency). Then there is the Gold Bar deals such as the $19.99 Pay Day Gold Pack, which offers 480 Gold Bars (a 20% Bonus). The above selections represent the purely optional purchases, but unfortunately there is another type in the game as well - the nearly-forced buys. These consist mostly of Energy Refills. You see the Hunt System is controlled by the available Energy you have. That is not one of the well-liked approaches for Freemium gaming but there you have it. Each hunt you go on spends one Energy Point. You only have 10 of them - as long as you level up during the session you will restore the 10 Energy slots. But if you fail too much in the objective hunts, you can end up out of Energy - which means spending Premium Currency (Gold Bars) to refill the meter. The thing is you only have to pay to refill the meter if you want to immediately play - if you wait for the timer to run out, the meter will recharge on its own, so nearly-forced is an accurate description. Game Play is divided into a number of hunt types and regular hunts and challenges. The most points and therefore best rewards appear to be had in the challenges, but if you are just looking for a relaxing hunt in which you can stalk your preferred game, line up your shot, and be the Zen Hunter, you can find that too. The basic rewards system in the game depends on the type of hunting you are doing. For example on a Contract Hunt, you are sent out to kill a specific number of a specific animal. For a Trophy Hunt you are naturally trying to kill a specific trophy animal - like a white tailed deer with a nice rack - but you will need to kill it with a specific shot. 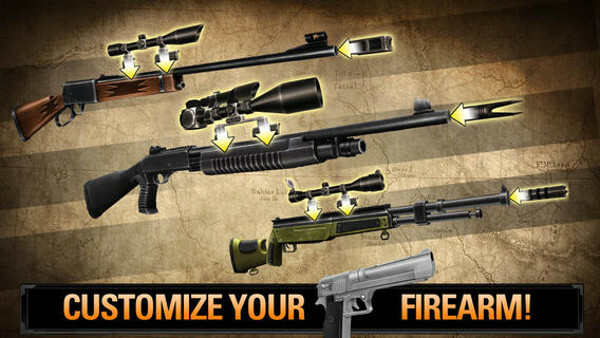 The Hunting Series is the base game, and it consists of a wide selection of shot-challenges and game types, as well as weapon and ammunition requirements. When you do each hunt the game will let you know of you don't have the optimal setup in either weapon or ammo, and you have the opportunity to correct that situation. Failing to do so makes the hunt a LOT harder as you may have to use multiple shots to bring down a target, which makes it all the more likely you will fail. Even when you are not using a fully upgraded weapon though, you can use refillable supplies like hollow-point bullets and energy drinks that slow time to compensate and still pull off a kill to the required shot. The game does have quite a bit of leeway in terms of how you approach each mission! Although we would classify the graphics as cartoon-like, they are a more realistic cartoon-like display that does not leave the player lacking in eye-candy or missing the all-important point at which disbelief is suspended and the imagination kicks into full gear. 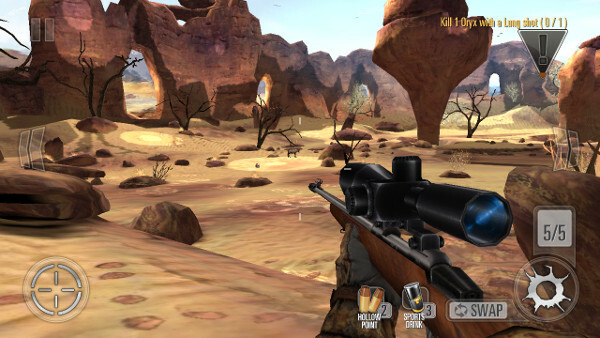 The game that you are hunting looks realistic enough to be pleasing to the eye, and the shooting - though it is somewhat compromised by the necessity to translate it from a trigger pull to a tap and touch aiming due to the touchscreen interface retains a level of challenge that is similar to the real thing. While the game does not use licensed music as far as we can tell - the music it has is electronic pop that is set to the mood - it does include an awesome array of sound effects, from burbling brooks and birdsong, to wind in the trees and just the sort of report you expect to hear from each weapon type. When you stop to consider that this is a free to play game, it is worth the price of admission - there is no question about that. But even with the two different in-game purchase schemes that it uses, the entertainment, the challenges, and the wide array of options for upgrading and weapon selection add an element that you really do not expect to find in a freemium title like this one. 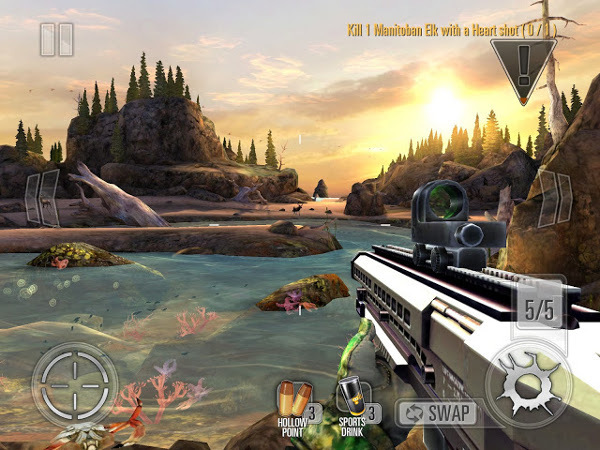 In fact Deer Hunter 2014 is a surprise all the way around - it is high enough quality that you may find yourself wondering how they could give it away for free, and high enough quality so that you don't mind the in-game purchase system. One thing we do feel strongly about, however, was the inclusion of forced ads. Considering the in-game purchase system - and how profitable that must be for the developer - the inclusion of forced ads in addition to that is not just overkill, it feels almost insulting. Still we gave this one a very solid 4 out of 5 and recommend it if you are into recreational hunting. Proud to be “App Store's Best of 2014” ..